Brace yourselves Perth, for the new bing craze is coming near you! Recently, I was invited by Sean Gentry, the co-owner of Bing Go Street Food to give some of these bings a try at one of their stores. Bing comes from Jianbing, a crepe made and sold by street vendors in Beijing. It is a thin crepe lined with egg and a selection of fresh ingredients prepared hot and fresh while you wait. For this visit, I brought my two friends along, Tracy and Reka for lunch at Bing Go located at the food court of Enex100 in Perth city. 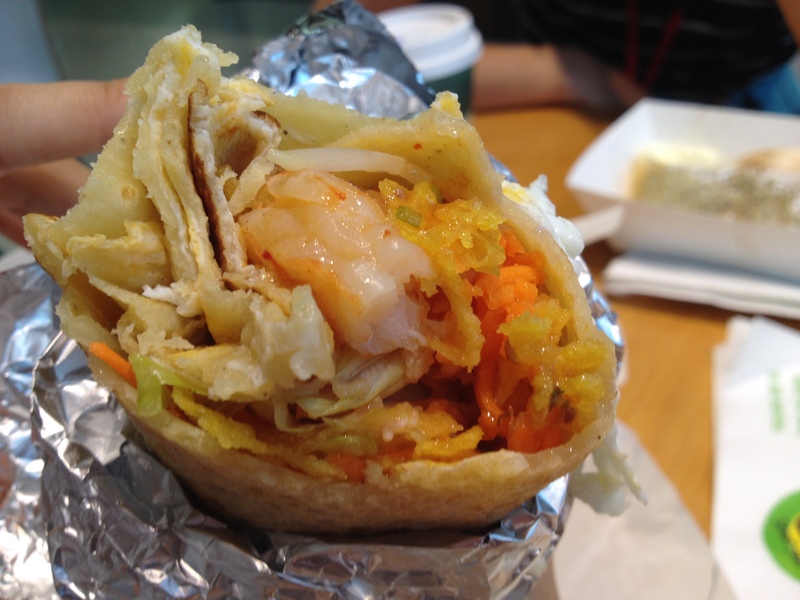 Tracy had the Prawn Bing ($9.90) which consists of garlic prawns, celery, bean sprouts and Bing Go sauce. 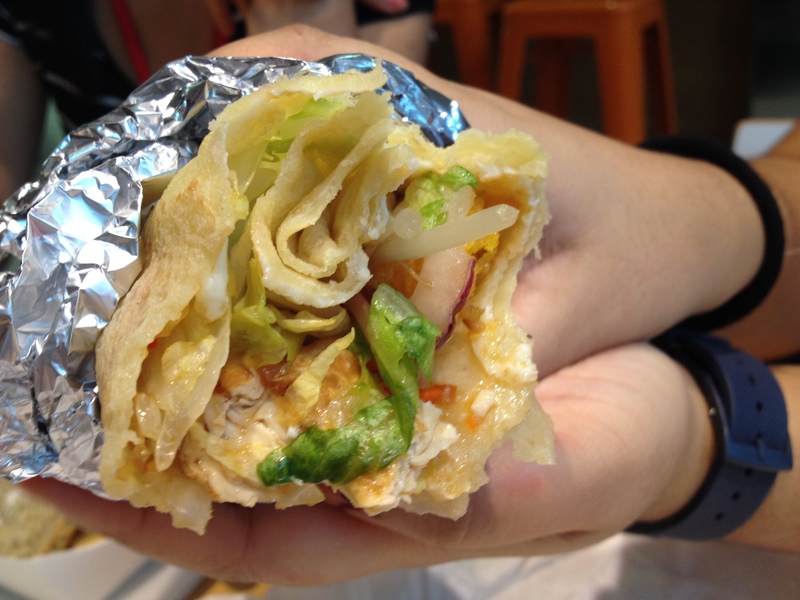 Here’s a review of her Prawn Bing – the prawn bing is a delicious wrap filled with succulent garlic prawns and is nicely contrasted by the crunchy wonton ‘chips’, a fresh salad and plenty of sweet chilli sauce. Will definitely be back to try other flavours! Reka had the Buddha Bing ($8.90) which comprises of avocado, fried tofu, bean sprouts, red onion, hoisin sauce and Bing Go sauce. 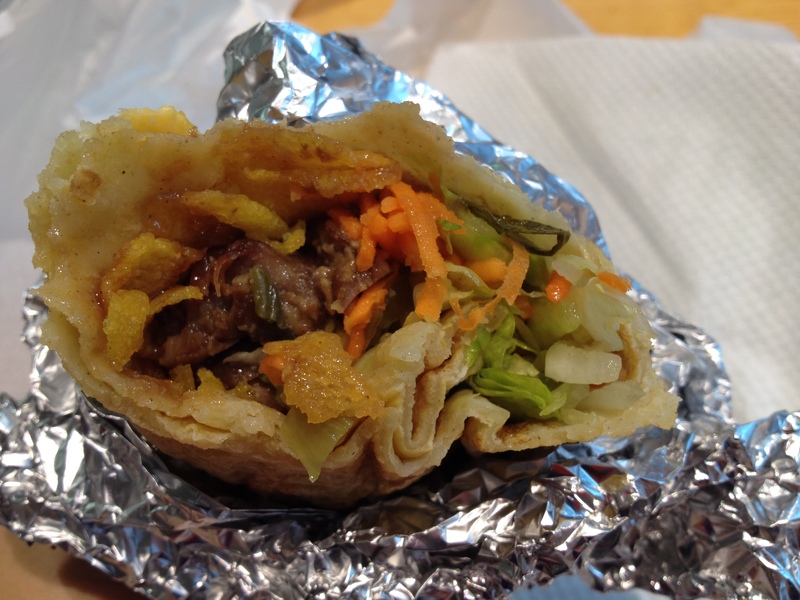 Here’s Reka’s review of the Buddha Bing – Loved every bite of the Buddha bing. It was a VERY filling crepe that had a good combination of freshly shredded veggies, sweetness of the hoisin sauce along with the buttery texture of the avocado and the extra crunch from the fried tofu. Definitely will go back and order it again!!! I had the Char Siu Bing ($8.90) which consists of char siu pork, chinese sausage, mustard vegetable and char siu sauce. I really enjoyed the char siu bing. The char siu pork was juicy and tender with a hint of sweetness from the char siu sauce. It was delicious, fresh and flavoursome. 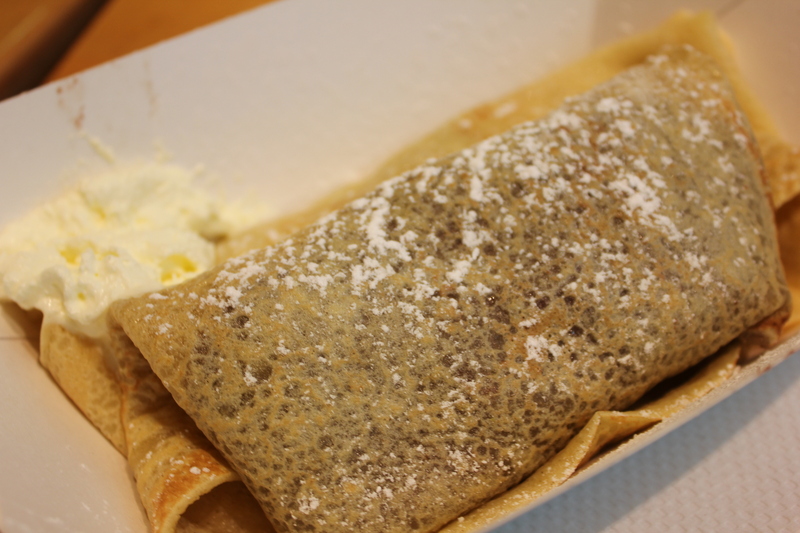 The crepe itself was light and fluffy, complementing well with the freshness of the ingredients. Will be back one day to get my bing fix! To finish, we had a sweet bing to share which was the Hong Kong Heaven ($6.90) which consists of bing with nutella, strawberry and crispy wonton pieces. There was a crunch with every bite from the crispy wonton pieces together with rich, sweet flavours coming from the nutella and strawberry. I can’t agree more that nutella and strawberry is the best combination ever, it’s like a matchmake in heaven. When you are at Bing Go, you can either choose your crepe original or gluten free. If you like spicy and you want to add some heat to your bing, you can ask to add fresh chilli for free. Love your meat or seafood? Double it up for $2.90. Ordering the bing is simple, fast and you are good to go and ready to enjoy your bing. Oh and not forgetting that there are also plenty of choices on their menu to suit all types of palates. What are you waiting for? Head to your nearest Bing Go store and get yourself a bing to enjoy today! I don’t know what is happening with all the Bing-go’s around Perth. Was meant to go to one of their stores in Karrinyup a month ago and it was shut 😦 Didn’t know they have taken down their website, facebook and instagram too.